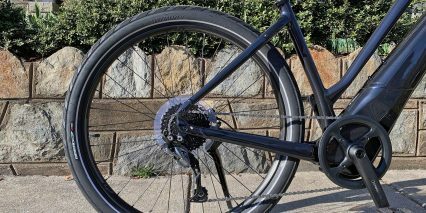 Today we are taking a closer look at the Specialized Turbo Como 3.0. The Como comes in a few variations and the 3.0 is the entry level point this year for Specialized electric bike products. Although I say entry point, it is hardly a slouch. The Specialized name has a lot to live up to so the Turbo Como 3.0 is still equipped with a Brose mid-drive, Tektro hydraulic brakes, and a bunch of other neat features that set it apart, so it is quite a deal at $2,949. 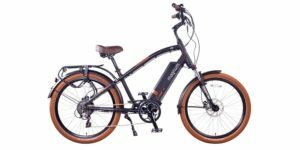 The Turbo Como 3.0 comes in 5 different colors, 2 frame styles, and a few sizes within each frame style. The one I am checking out today is this low entry step-through. It’s a bit of a mid-step, but I would still say just low enough to classify it as a step-through. 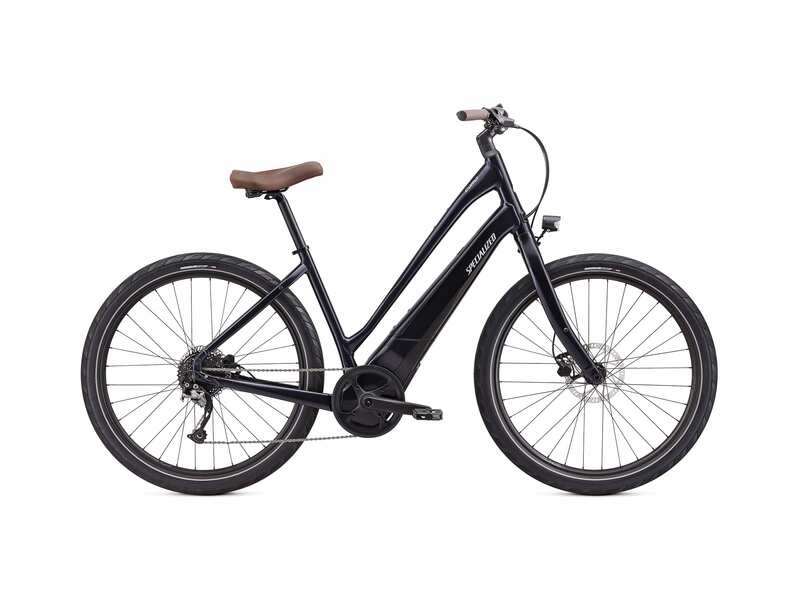 Even the high-step frame has a sloping toptube, so really the bike overall is almost made for comfort. 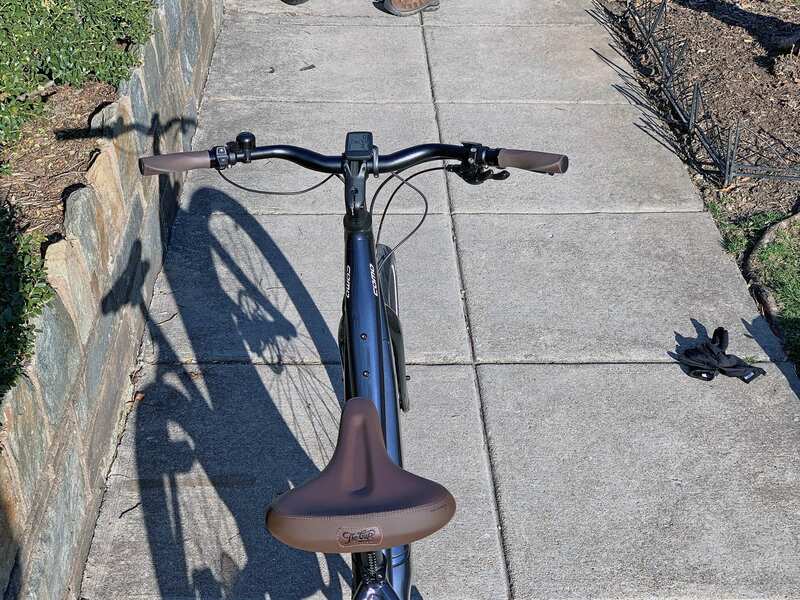 It is a bit of a cruiser with the seat tube angled back and you get this saddle with elastomer bumpers called “The Cup” with is one of my favorite bike saddles out there, it really gives you some cushioning. This is good, because there is really no suspension anywhere on the bike and there are some rigid parts like the seat post and fork. 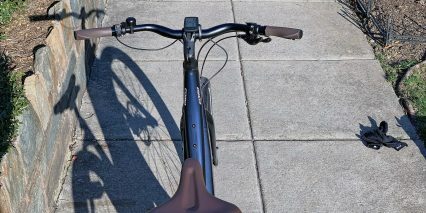 Comfort comes in other areas like this short stem with an upward angle and these septs back handlebars, really adding to a relaxed riding position. 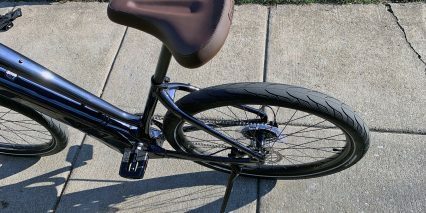 Along with the saddle and geometry, the tires also help to add some absorption. 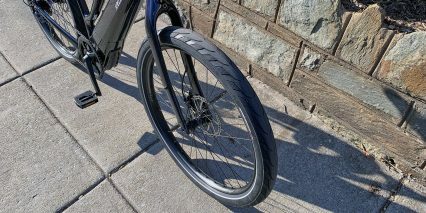 These are Nimbus Sport tires with both reflective sidewalls and Black Belt puncture protection, so smooth, thick, durable, and extra volume is the result. These are rated 25-50psi and dropping that pressure really can add to the comfort. The 36 hole rims here continue the safety with a reflective sticker to it. 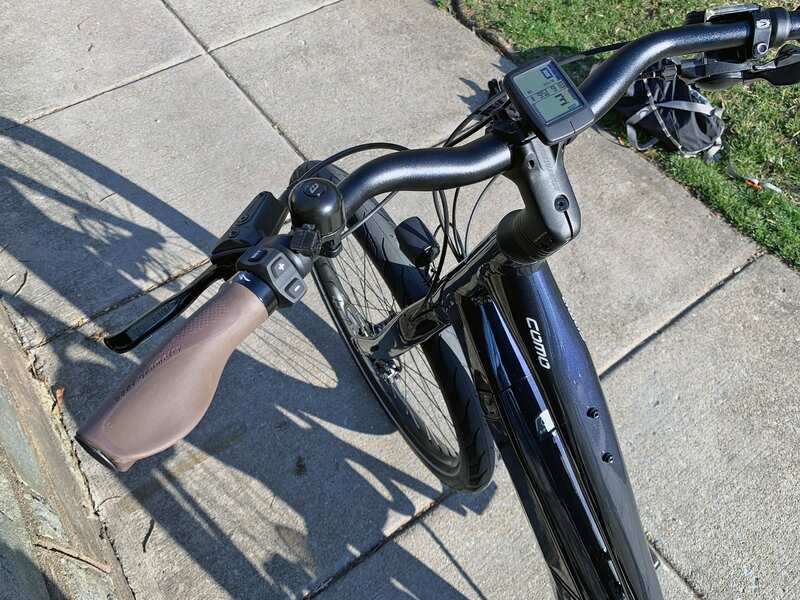 I also see these ergonomic locking grips and a 30.9mm seat post, so you could even add a suspension seat post if you want to keep complimenting the setup. I would be careful however, if you do swap out that seat post, then do mind the internally routed cable for the rear light, it does run through the seat post and getting it back on there with a new setup could be tricky. So yeah, I should mention that there is a battery integrated light system here. 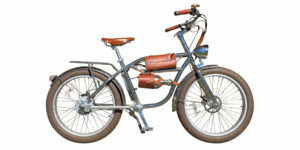 The front is a beautiful Hermans light that is fork mounted and points where you steer. The rear light is attached to the bottom of the saddle and is a little small, but still pretty cool and raised nice and high. However, if you are wearing a jacket or install a rack and put a high trunk bag back there, it could cover it, so do be mindful of that. A lot of the parts on the bike are branded by Specialized which is a nice touch and when you really start paying attention, there is a lot of top notch mountain bike tech that carried over to this bike that you will notice when we dive into the motor and mechanicals. I even notice the front has a 15mm through axle which is almost like mountain bike componentry. In the rear there is a 12mm through axle also thicker than usual, so really a good upgrade. 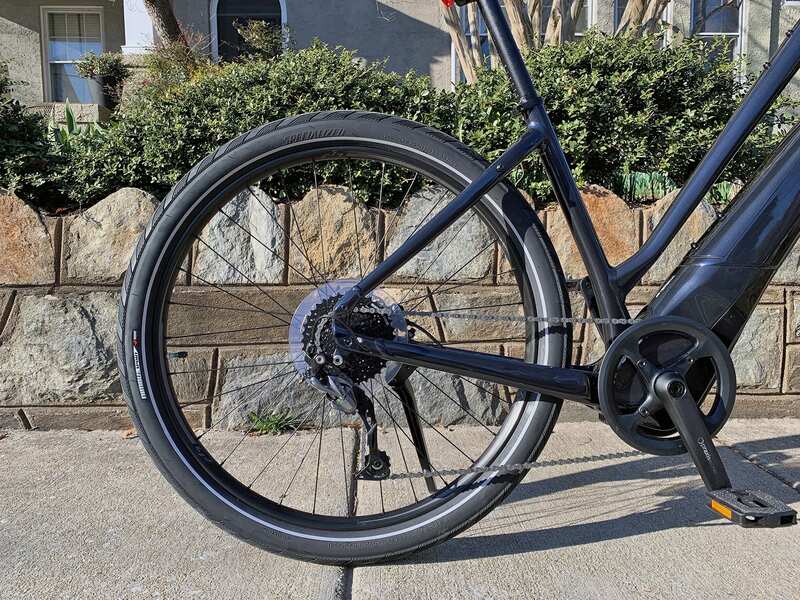 But for now, I’m still looking at these commuter friendly features like how the aluminum alloy fork has mounting points for fenders, side mounts for pannier bags, and even another lower boss that could mount an additional fender arm to keep it steady. Speaking of bosses, there are two sets here, one on the toptube, and one on the downtube battery casing. 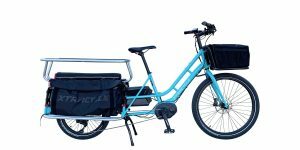 The one on the battery can’t really fit much since it wedged so close to the sloping top tube, but I suppose you could fit a Boomerang anti-theft device or something. 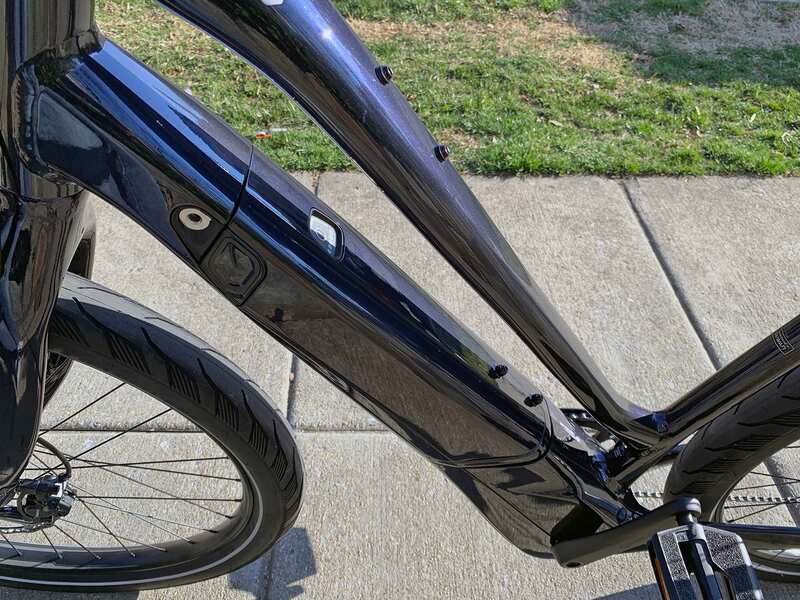 The bike has this nice black plastic shield, kind of a chain ring guard, that is really designed well to keep your pants or dress free and clean. 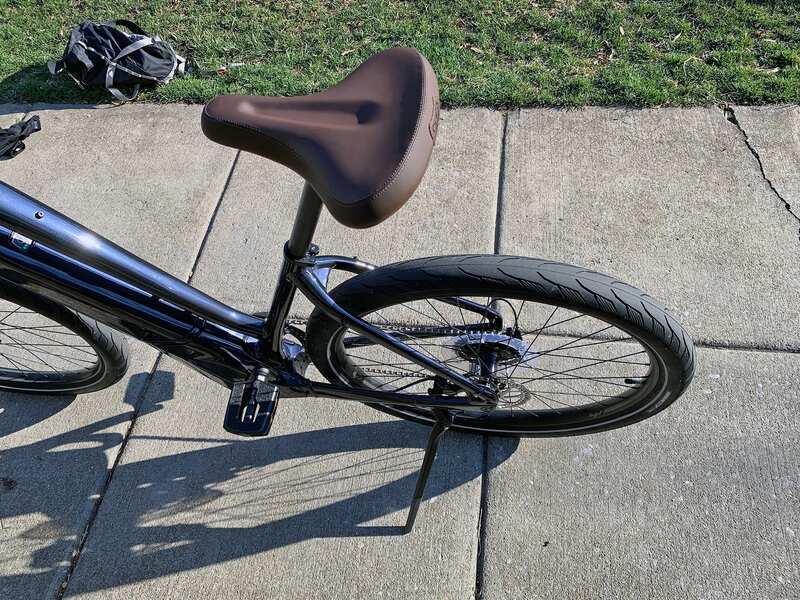 The custom kickstand, bell, and nylon platform pedals with sandpaper grips are all black too, so a lot of nice matching accents to compliment the cool paint colors. There is also a slap guard sticker to protect that paint from the chain, so a lot of thoughtful touches here. 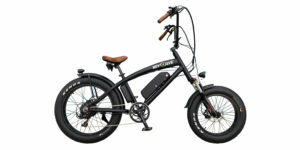 At $2,949, this is really great cause you get a mid-drive, fully integrated battery, color machine options, and bosses. 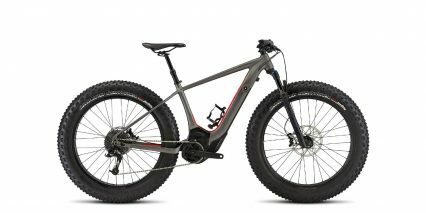 Overall the bike weighs 46.5lbs which is really just incredible, and there are a lot of upgrade possibilities. If you get a chance to check out the review video, I recommend it since there is an example of a more custom setup if you are curious. 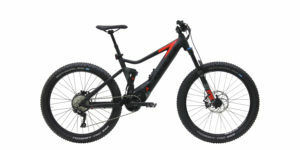 Driving the bike is a Brose C mid-drive, however this one is called the Brose CB with the B designating that is is a specific customized setup just for Specialized. This is a street tuned motor with a nominal rating of 250watts and 50nm of torque. Although it may be slightly limited compared with other Brose/Specialized setups, it is still very sophisticated and capable. It’s about 7.5lbs and measures rear wheel speed, pedal cadence, and pedal torque. 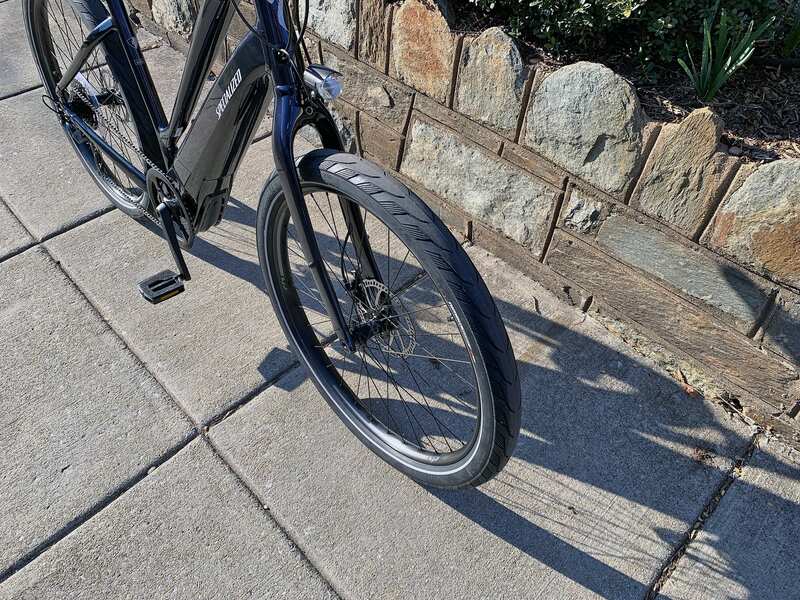 Even the magnet sensor isn’t something that just sticks out on the spokes, but is rather tucked in and integrated into the rear disc brake… pretty clever! 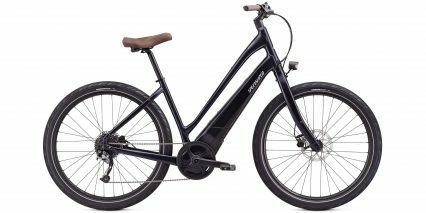 Since the Brose mid-drive uses an internal belt system it makes the ride very peppy and zippy, as well very smooth and very quiet, really a great motor. Complimenting the motor is this 48 tooth chain ring which is rather large so it will slow your candle down for a nice relaxed and smooth cruiser ride. 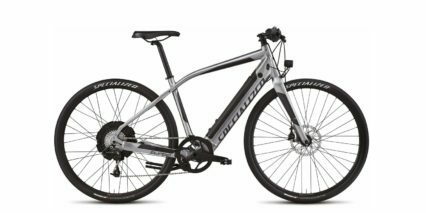 It’s got a 11-36 tooth 9 speed Shimano Alivio cassette, excellent for climbing or hitting and maintaining that 20mph speed. I did notice there was no 1 way shadow clutch here, but still a good configuration overall. 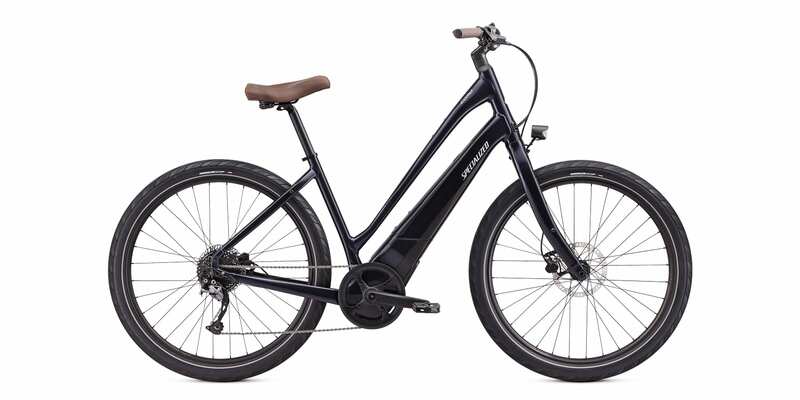 For stopping power, the Como 3.0 features a set of Tektro hydraulic brakes with 2 finger adjustable levers and a 180mm rotor disc in the front and 160mm in the rear. 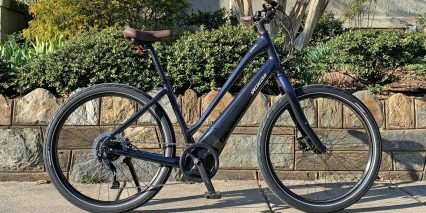 The battery pack design offered for all Specialized Turbo Como models looks the same, but with the 3.0 trim level you get a lower capacity from cells that aren’t as energy dense. 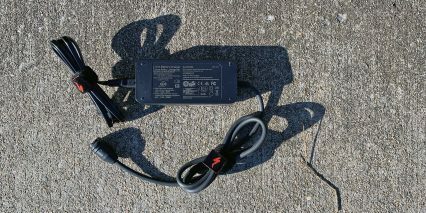 It offers 36 volts and 12.8 amp hours for a total of 460 watt hours vs. 504 watt hours on the 4.0 and 5.0 models. 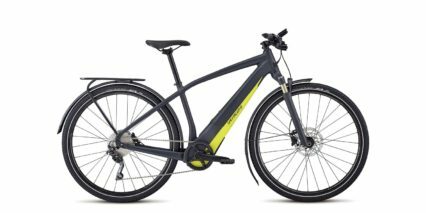 In my experience, 460 wh is still close to average in terms of capacity and it makes the bike lighter and cheaper. 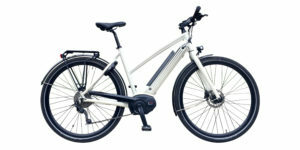 Compared to a hub motor driven electric bike, you tend to get better range regardless of battery capacity because a mid-drive can operate very efficiently as you switch gears. 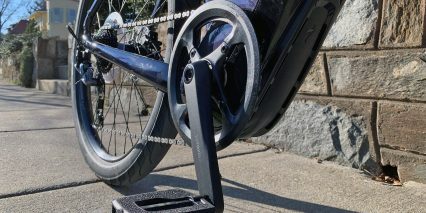 The key is to shift down when climbing and up a bit when riding faster so that the motor doesn’t have to overwork. One trade-off here is that shifting under power (both your leg power and the motor power) can wear the chain, sprockets, and derailleur out more quickly than a hub-motor ebike or a non-electric bike. 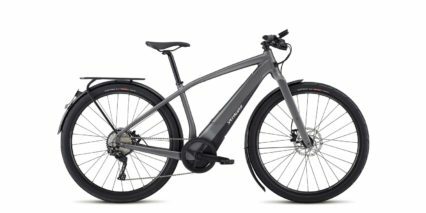 And, the Brose system doesn’t offer any kind of shift detection to ease-back and protect the drivetrain the way that Bosch and Impulse do. 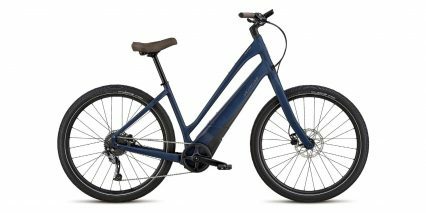 I have found that you can manually ease-off when pedaling and shifting to alert the motor to back off, and this makes it smoother. 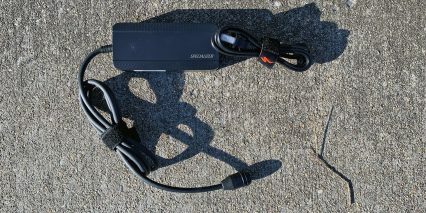 Just like the motor, the battery pack has been customized by Specialized and is paint-matched to blend in. Rather than seating in from the top, they designed a pack that sort of slides in from the left side of the frame. 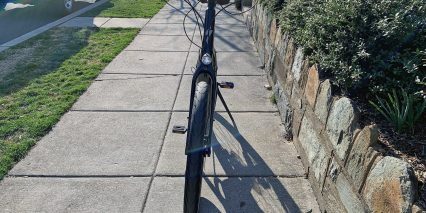 This allows the top tube to be lower, making the bike easier to mount and stand over. 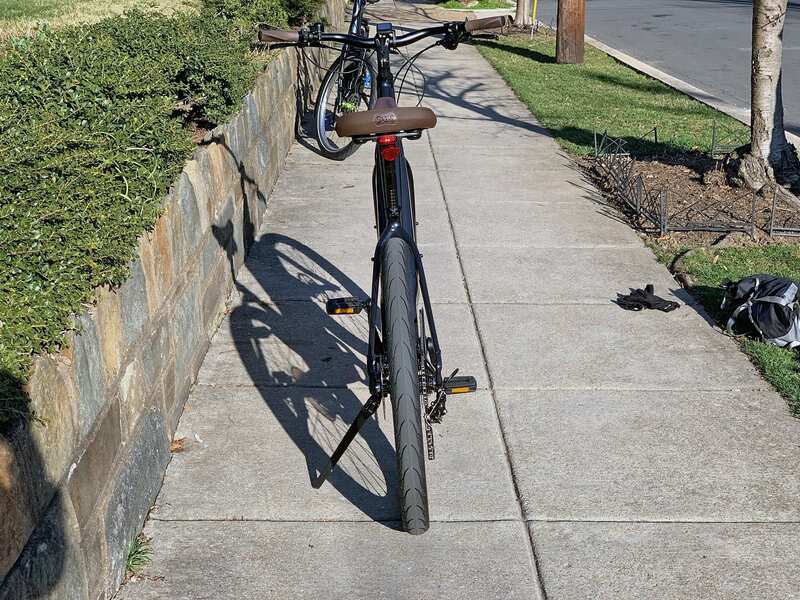 The pack can be charged on or off the frame and uses an ABUS key which comes with a code for use in matching lock accessories (like folding locks, chains, or u-locks to keep your bike safe). 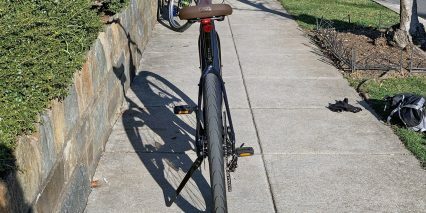 It’s a neat touch, one that could help you reduce clutter while protecting the bike. One thing I really like about this new pack design is that they are using the magnetic Rosenberger charging standard and have a little cover that keeps it clean on the side of the bike… with a plastic leash so you won’t misplace the cover! 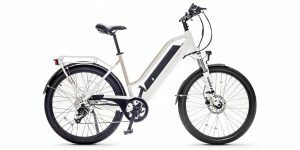 So many other electric bikes that use this charging standard do not have a leash for the cover and people end up setting it down and losing it easily. The motor, battery, and display are all designed to be water resistant regardless, but I like to keep my stuff clean and beautiful looking, so the black cover is worth keeping track of. 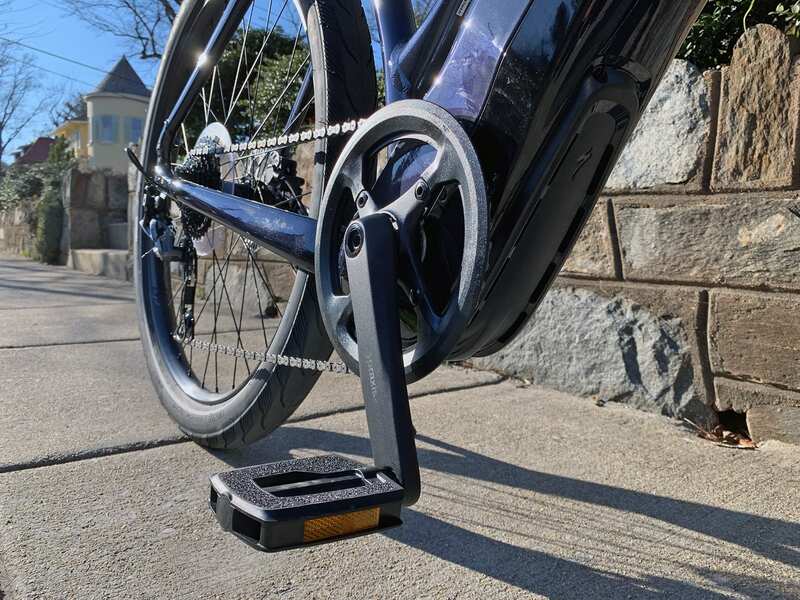 I should also note that the charging end of the ebike charger is magnetic and can pick up some metal filings if dropped onto garage floors or some sandy environments. 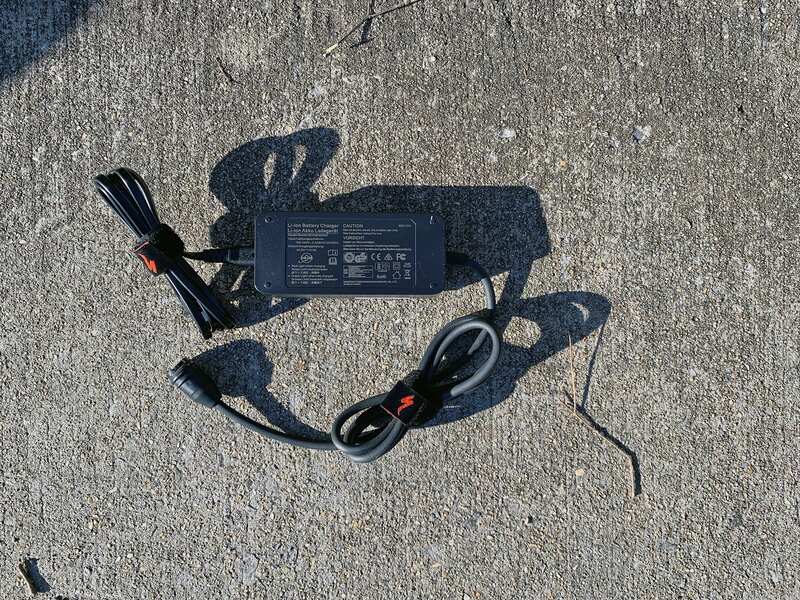 Just keep an eye on this, and take good care of the charger, a compact 2-Amp charger for travel situations where weight and space are priorities. 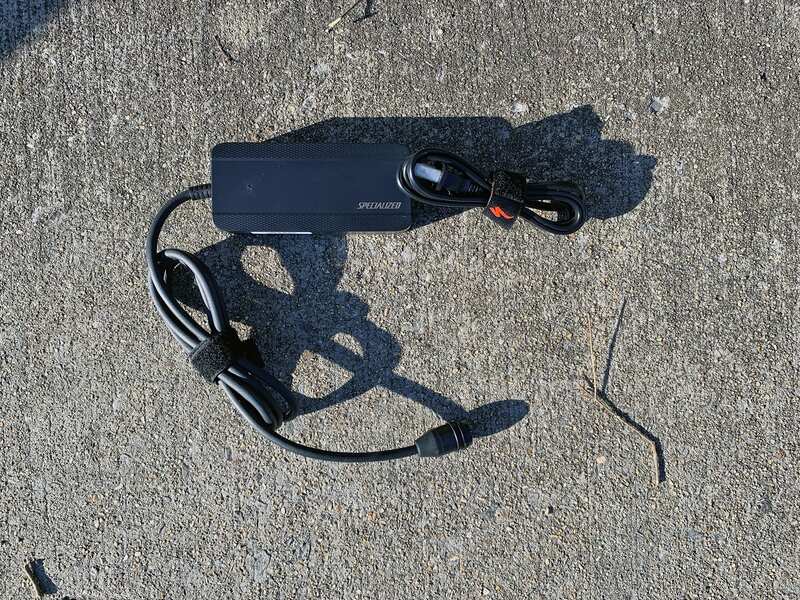 Something else I should note is that locking the battery into the bike can be a little tricky. As shown in the video, you really gotta line it up right and make sure you have a nice good secure click into place, rather than a phantom click which could confuse you. The display panel on the Turbo Como the TCD (Turbo Connect Display). I like it because it’s large, is backlit, has integration with the Specialized Mission Control app, and has a dedicated light button. Hold down left and right to enter settings, while + and – allow you to go up and down. 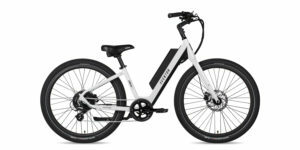 Unfortunately, it appears that you must turn the bike on by pressing a power button on top of the battery pack vs. a button on this control ring… and that requires some reaching or planning. It’s a minor gripe, but made a little worse from the slow startup of the display. The display is not removable, but can be tilted a bit. I do like how the battery readout is in percentages here as well as a 10 bar infographic. The two buttons on the display can be cycle through pages and so can the controls on the side. You can cycle through distance, average speed, timer, pedal cadence, heart rate monitor, power levels, k-calorie, and more. There is also integration with Mission Control. This app allows you to further customize power output from the motor in each level of assist or plan rides in a way that the battery will not run out (the bike will automatically provide power based on how far you have yet to travel). It’s one of the cooler apps, but it’s completely unnecessary to just get on and ride. 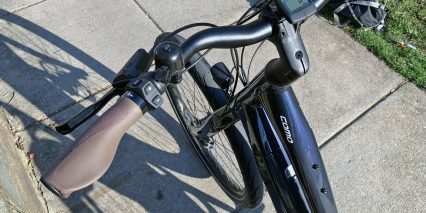 The setup allows for 3 levels of pedal assist as well as a 0 mode where the system is completely off. 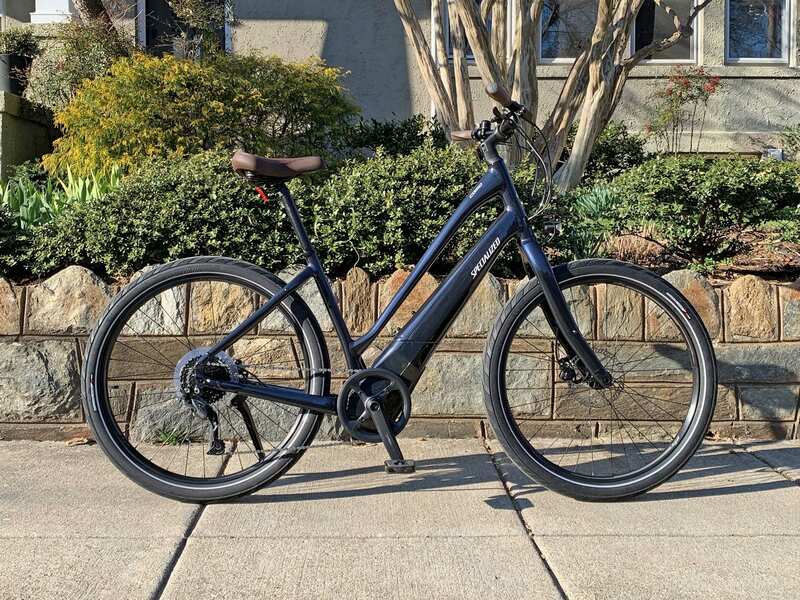 If I could sum up the Turbo Como 3.0, I would say it feels quiet and tight, really a streamlined concept and will likely be a great consideration if you are looking into it. However, there are some tradeoffs to recap, so let’s go over those real quick. 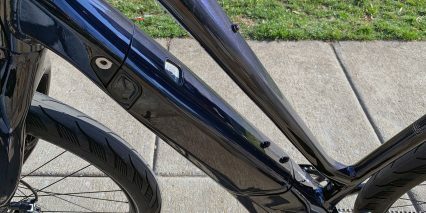 Although there are comfort points, there is no suspension anywhere on the bike so keep that in mind. If you did want to replace that rigid seat post, there are integrated wires for that rear light back there so be careful of that too. 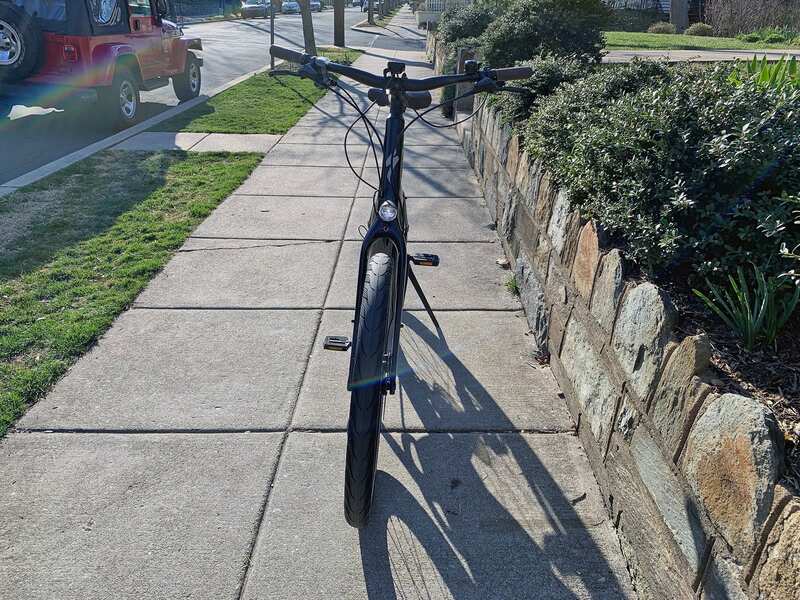 Speaking of the rear light, I noticed that the placement of it means it could be blocked if you are wearing a jacket or coat and it drapes over it, or if you install a rear rack and put a trunk bag there. 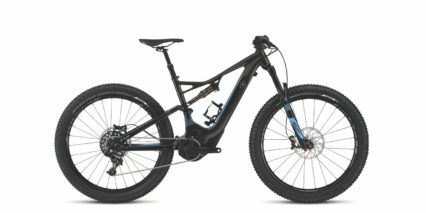 However, when you consider some of the mountain bike tech on here and that customization options present (like the other version in the video), the bike really starts coming together. 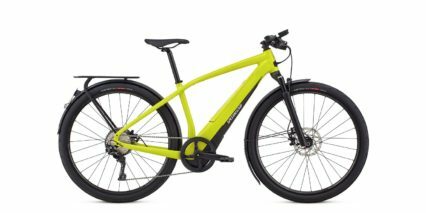 Adding the dealer support network and Specialized reputation to it, it becomes a more solid offer than many other entry point Ebikes. 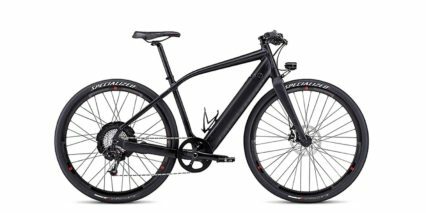 I would like to thank Specialized for letting me do some real world riding on the Turbo Como 3.0.